Petit Pillow Switch – mountable, flexable, gooseneck switch with padding for use near sensitive activation locations such as the head. Big Mack Switch (yellow or purple) – a large activation surface with a single message output, includes external switch jack. (2) Little Step-by-Step Communicator/Switches – plays back your recorded messages in sequential order, includes external switch jack. 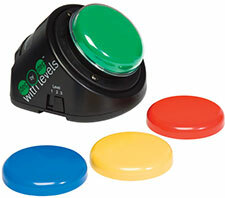 Switch Latch Timer (by Ablenet) – set the time that a toy or appliance is active after a switch is pressed. Battery Adapters (AA/AAA, C/D) – adapt any toy or device that has an on/off button and runs on batteries.